In the C6 era, Z51 evolves. In fact, it's about 3/4ths the way to an '04 Z06 and it gets that far in a quieter and nicer-riding manner. While Z51's ride is only incrementally more firm than a base C6, it seems about as soft and maybe more poised than a base C5 because body motions are less severe and it's not on the jounce bumpers as much. Z51 adds higher-rate springs, higher-rate antiroll bars and larger-diameter, more stiffly-valved shocks, special tires, a power steering cooler and, on six-speed, a trans cooler. A major contributor this its almost-a-Z06-handling, is the new, Goodyear F1 Supercar EMT tire. In a nutshell, it's the original Z06 tire with slightly more tread depth, slightly less tread width, and the more compliant 3rd Gen. EMT casing. While, with the exception of pads and caliper color, all C5 brakes were the same; C6 has two systems: base and Z51. The uplevel brakes are heavier-duty because of Z51's higher-performance nature and, no doubt, to accommodate the '06 Z06, which, in about a year, will have Porsche 911 GT, Dodge Viper and Ford GT owners running to their doctors for Zoloft. When I drove this Z51's sister on the MRC, I could feel the car working really well but it wasn't until I got out in the infield with a 300-mm telephoto on my Nikon that I realized how flat the car corners. Driving is GM's Mike Neal. Looks like a Z06, doesn't it? Image: Author. All this Z51 stuff gets the car's lateral acceleration to .99g. The car is more crisp in transistions. Extra ride travel keeps the suspension off the jounce bumpers and makes driving a Z51 at the ragged edge a less ragged experience. The brake enhancements may not be noticed much on the street–except for maybe the cute, drilled rotors–but on the track, especially; the car stops better and more consistently as heat builds. Obviously, Z51 will lap race courses quicker than base cars. Quicker. Faster. Better handling. Nicer Riding. Better brakes. Almost a Z06 on the cheap. What's not to like? First time you're in a C6, you'll notice how quiet the car is. As a C5er, inevitably you're asking, "What!? Did you say,'Quiet.'!?" GM and Goodyear engineers, acting on "voice-of-the-customer" input and a strong mandate from VLE, David Hill, reduced interior noise in the '05. GM spent considerable time with "statistical energy analysis" (SEA) which uses sophisticated sensors and computer programming to determine what a sound's source, frequency and amplitude are and from what direction and through what medium it comes. SEA determined a major problem was airborne noise caused by: a stiff EMT tire casing, coarse pavement and highway speeds combining to excite the tire at about 800 Hz. Because that's in the frequency range of human speech; in an EMT-shod C5, it's sometimes difficult to carryon conversations or listen to the radio. The noise reduction strategy was threefold: 1) new EMT tire architecture which makes less noise, then transmits less of that less noise to the interior, 2) stiffening parts of the underbody "tub" behind the seats and 3) use of a new, lightweight, sound insulation material in the cargo area, beneath the seats and on the firewall. The result? 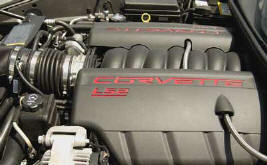 The C6 version of the LS2. This engine, in slightly different trim, is also used in the '05 SSR. A 400hp base Corvette is a pretty awesome machine. Image: Author. Ok, the math's a little strange but it's math we like. 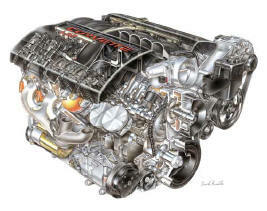 The six-liter (366 cubic inch), 400 horsepower, LS2 is the largest, most powerful standard engine ever put in a Vette. It's, also, the most refined, most fuel efficient and least polluting. This new engine powers a C6, Z51, manual, coupe to 0-60 and quarter miles times just short of those of a '02-'04 Z06 and...the only thing that keeps the '05 from waxing the four-oh-five-horse, zed-ought-six is 61 pounds and rear tires a bit less wide. Anyone who's a good drag racer can get in an '05 like that and, as long as there's good air and adequate traction, go mid/high 12s at 110-115. Top speed? Well–I also own a ZR-1. Imagine how hard it is to admit: the "Fastest Production Corvette" title passes to C6. 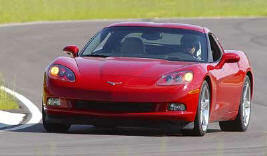 Last spring, a production 2005 coupe went 186 mph in testing done to validate Chevrolet advertising. Fold the mirrors back and tape over the directional signal lights and you'll get 190. How does the LS2 produce 50 more horsepower from a package that: is the same physical size, weighs a little less than, gets about the same mileage as and emits less pollutants than C5's base engine? A new aluminum block was required because of LS2's larger bores and that GM wanted a stronger and lighter part. To make way for GM's Displacement on Demand hardware (not used on C6, but is on other vehicles using the same block casting) the knock sensors moved from the valley to the sides of the block. Computational Fluid Dynamics (CFD) was used model a redesign of the block's cooling passages to ensure proper cooling in-spite of elimination of the LS1's partially-siamesed bores in the interest of increased strength in the block decks. The crankshaft is a rebalanced version of the LS1/6 unit. The connecting rod is based on the LS1/6 forging but its small-end is, now, bushed for a floating wrist pin. The oil pan is a new, lighter design which has oil control better than the C5 "bat-wing" pan and does that with a quart less oil. LS2 pistons are 101.6-mm in diameter and take floating pins. GM cites noise reduction as the reason for going to floating pins but durability of next year's LS7 may be another reason. Anodized ring lands and polymer-coated skirts, introduced on the LS6, continue. The new pistons are responsible for an increase in compression ratio to 10.87:1. The rings use the same general design as the LS6 but they fit the larger bore, are more narrow and have lower tension. LS2's camshaft is from the '01 (385-hp) LS6. The LS2 cylinder head assembly uses the proven, LS6 casting and is fitted with '01 LS6 valves. The rest of the LS2's valve gear carries over from the LS6. C6's induction system, from the air inlet to the intake manifold is new. The air filter assembly, intake duct, mass airflow sensor, 90-mm. throttle body and intake manifold are improved designs. In total, there is a 31% reduction in intake restriction compared to the LS1. There has been a major change in the engine's crankcase ventilation system. Both air-oil separators were redesigned for improved operation. CFD, with the addition of a proprietary GM software code called "rain drop analysis," allows modeling airflow systems where liquid droplets are present. It was used to analyze crankcase vapor flow through the engine and that information was applied to the new separator design. The net result is less oil consumption, especially at high rpm. LS2's exhaust manifolds are 33% lighter and 4% less restrictive. C6es use only two catalytic converters and they are a low-restriction, close-coupled design which increases performance and reduces emissions. The exhaust system downstream of the cats has, also, been redesigned with higher-flow mufflers which mount longitudinally, eliminating four 90-degree pipe bends. All of this was worth a 10%, total reduction in back pressure, compared to the '01-'04 LS1. accuracy. In addition, more accurate control of air metering, fuel metering, exhaust emissions controls were desired. The engine's redline was raised to 6500 rpm and it's rev limiter is now at 6600. Lastly, GM wanted to move the electronic throttle functions from a separate module into the ECM. All this required a more robust controller and the new, LS2 Engine Control Module (ECM) is faster acting, has more memory and can control more devices. So, now you know from where comes the new engine's 400lbs/ft@4400rpm and 400hp@6000. Click the WestCost Logo For Corporate Specials !